Few musicians possess a level of ability that can be considered virtuoso. Chad Wackerman is just that…a true drummer’s drummer. His professional career began in 1978 with the Bill Watrous band. Since then, he has amassed a remarkable body of work including a seven-year association with Frank Zappa, resulting in worldwide tours and 26 studio & live albums. Chad’s other long association is with guitar legend Allan Holdsworth, spanning decades. He’s has appeared on over 6 albums with the ground-breaking guitarist. Showing his expert musicality, Chad played with vocal-legend Barbra Streisand at a fundraiser at her home, which became an HBO special and a best-selling DVD called "One Voice." 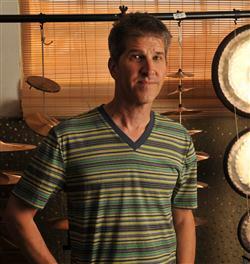 Recently, Chad Wackerman has been performing live shows with America's iconic singer/songwriter James Taylor. To shift gears musically from the intense music of Zappa and Holdsworth to the sensitive, lyrical songs of Taylor and Streisand, Chad has deservedly become one of music's most sought-after drummers. Wackerman has recorded albums and toured with an electric eclectic list of artists including Steve Vai, Andy Summers, Men At Work, Albert Lee, Colin Hay, Dweezil Zappa, Alan Pasqua, Carl Verheyen, David Garfield, John Patitucci, Joe Sample, Banned From Utopia, Robbie Krieger, and The World Drummer's Ensemble (featuring Bill Bruford, Luis Conte, Dou Dou Ndiaye Rose and Wackerman). His duo work with Terry Bozzio features a unique opportunity to see the two Zappa drumming masters in a percussive conversation. To date, they have released 2 DVDs - “Solos and Duets Featuring The Black Page” and “D2-Terry Bozzio & Chad Wackerman”. As a bandleader and composer, Chad has five critically acclaimed CDs, including his latest release, "Dreams Nightmares and Improvisations" - a collection of improvisatory collaborations and original compositions, which also features Alan Holdsworth, Jimmy Johnson and Jim Cox. Chad Wackerman talks through his CW-1 signature model and lays down some fresh beats! Chad Wackerman has recently introduced a limited edition box set edition of his latest album, "Dreams, Nightmares, and Improvisations". IP signature artist Chad Wackerman will join Steve Wilson of Porcupine Tree for the North and South American legs of his tour.